As is evident from the discussion so far. non comparative itemized rating scales need not be used as originally proposed but can take many different forms. The researcher must make six major decisions when constructing any of these scales. Two conflicting considerations arc involved in deciding the number of scale categories. The greater the number of scale categories. the finer the discrimination among stimulus objects that is possible. On the other hand. most respondents cannot handle more than a few categories. Traditional guidelines suggest that the appropriate number of categories should be seven plus or minus two: between five and nine.’? Yet there is no single optimal number of categories. Several factors should be taken into account In deciding on the number of categories. The decision to use an odd or even number of categories depends on whether some of the respondents may be neutral on the response being measured. If a neutral or indifferent response is possible from at least some of the respondents, an odd number of categories should be used. If, on the other hand, the researcher wants to force a response or believes that no neutral or indifferent response exists, a rating scale with an even number of categories should be used. A related issue is whether the scale should be forced or non forced. category descriptions should be located as close to the response categories as possible. number of options are available respect to scale form or configuration. Scales can be presented vertically or horizontally. Categories can be expressed by boxes, discrete lines, or units on a continuum and mayor may not have numbers assigned to them. If numerical values are used, they may be positive, negative, or both. Several possible configurations are presented in Figure 9.2. 1. Develop Likert, semantic differential, and Stapel scales for measuring customer satisfaction toward Sears. 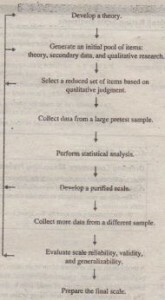 Data are collected on the reduced set of potential scale items from a large pretest sample of respondents. The data are analyzed using techniques such as correlations, exploratory factor analysis, confirmatory factor analysis, cluster analysis, discriminant analysis, and statistical tests discussed later in this book. As a result of these statistical analyses, several more items are eliminated, resulting in a purified scale. 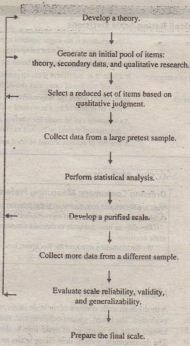 The purified scale is evaluated for reliability and validity by collecting more data from a different sample (see the following section). 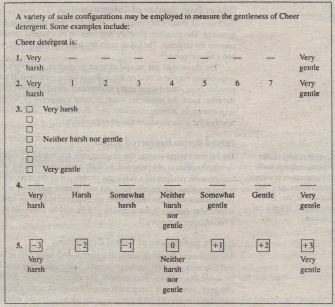 On the basis of these assessments, a set of scale items is selected. As can be seen from Figure 9.4, the scale development process is an iterative one with several feedback loops.